Some people might think that their life stops in the moment they have to start using a wheelchair. The truth is that there is a lot that life could offer them. For instance they could visit some state parks. Although some might say that all state parks are the same, they should know that Hillsborough River State Park is a bit different from this point of view. Although there isn’t access with wheelchairs to all parts of the state park, it can offer a lot to disabled people. Usually people visit state park for hiking and for camping. 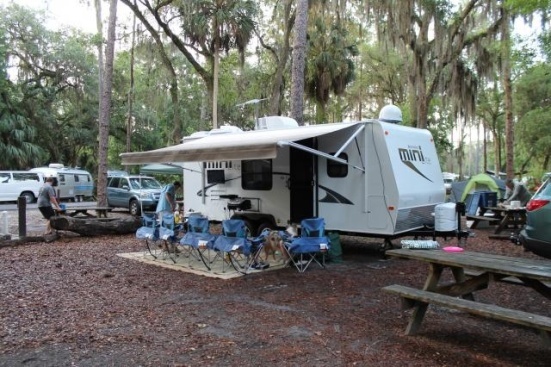 This state park comes with more than 100 campsites for RVs and tents. These sites come with water, picnic table, and a fire ring. The majority of the sites also come with electricity. Although at the moment there are no sewer hookups, there is a dumpsite on the park. Some of these sites have been especially created to have access with wheelchairs, but even the regular sites can be traversed by wheelchairs. Nonetheless, it might be a good idea to call the park and reserve a handicap campsite. It is best to bring your binoculars with you. There are five different trails to offer a view of the flora and fauna of the state and to show the visitors the five different kinds of fauna that can be found in the state park. The trails vary in length and difficulty. Usually they are covered by dirt and some loose sand so it is easy to push the wheelchairs. In the center of the state park you can find a restaurant and a gift shop. Here you can find snacks and sandwiches and various kinds of picnic and camping items. You may also rend carts, canoes, and kayaks. If you are interested in canoeing, you should attend a guided canoe tour. The state park also has a swimming pool that comes with salty water. The best thing about the pool is that it is accessible for disabled people as well. The restrooms of the park are clean and they can be accessed by disabled people as well. Some of the parking lots have specialized activities for handicapped people. Being in a wheelchair doesn’t seem to be so horrible if you get to see state parks of this kind that allow you to marvel at the beauty of nature.